Our portfolio company Prezi, that has been eating away at Microsoft’s Powerpoint and Apple’s Keynote market shares for the last few years, is poised to become a far more mainstream product than some might have previously thought. It’s making two major announcements today. The company announced this week on stage at Slush in Helsinki — that it has secured a $57M growth investment lead by Spectrum Equity, a growth private equity firm. 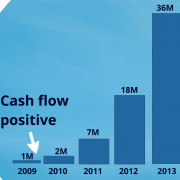 Prezi has passed the 50 million users mark, nearly doubling its user base in the past twelve months, and is attracting roughly 55,000 new users every day. Those users have now created 160 million ‘Prezis’ to date, allowing it to justifiably call itself the world’s largest publicly available database of presentations. By contrast Slideshare has only 15 million presentation. Prezi now employs 70 people in its San Francisco office, and 180 in its original home town, Budapest, which, in part thanks to them, has become a buzzing ecosystem for startups and innovation in Europe. CEO and co-founder Peter Arvai says Spectrum has “a long term perspective, just like we do” which hints at his plans to take the platform to the next level. Victor Parker, managing director at Spectrum Equity says they were attracted to the platform because it is “quickly becoming the preferred application for businesses, entrepreneurs and educators” and were impressed by its “growing user base and content library” as well as its “compelling business model”. “We want to help make two billion people make better decisions,” he says. It’s not often you meet entrepreneurs quite so focused on their product, but Arvai is the archetypical product-focused startup founder, who delights in talking about his product, his team and his company. Humans don’t just think in a logical, chronological order, they also think spatially. It’s so much easier to recall information if you can remember where it sat in relation to something else, whether that be location or by spacial association within the context of a story. So it was that Prezi’s interactive, zoomable canvas which could show the relationships between a big story and the finer details, that created such waves in 2009. This also means that follow-on funding for BootstrapLabs’ portfolio companies pass $90M. Prezi invests $100M in the White House ConnectED initiative! We just got the news from Peter Arvai (CEO and Co-founder of Prezi), as he gets ready to meet with President Obama this Friday the 28th. Peter will also show President Obama what makes Prezi the best way to share ideas and knowledge and share the story of how Prezi grew from 3 founders with big ideas and dreams in Hungary to Silicon Valley and to the World (Peter and me will share with those who attend Global Technology Symposium as well). This is part of Prezi’s commitment to join other industry leaders and invest $100M into the White House ConnectED initiative. Prezi, the software for delivering memorable presentations has joined other industry leaders in support of President Obama’s ConnectED initiative. Prezi’s commitment will provide $100 million in Edu Pro licenses to hundreds of thousands of high schools and educators across America. With Prezi, teachers will have a better way to help their students explore subjects, see how ideas are related, and collaborate with each other. The White House previously announced $750 million in commitments from 7 partners including Apple, Microsoft, AT&T, Sprint, Verizon, Autodesk, and O’Reilly Media. Prezi and Adobe are the latest technology companies to join the initiative, bringing the total ConnectED investment to more than $1 billion. Prezi is the presentation software that uses an open canvas instead of traditional slides to help people explore ideas, collaborate more effectively, and create visually dynamic presentations. 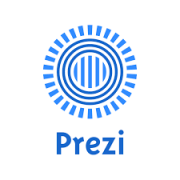 More than 35 million people from over 190 countries use Prezi from their desktops, browsers, iPads, or iPhones.Founded in 2009, and with offices in San Francisco and Budapest, Prezi provides a unique solution for anyone who needs to deliver a “wow” experience or simply share an idea—anytime, anywhere. 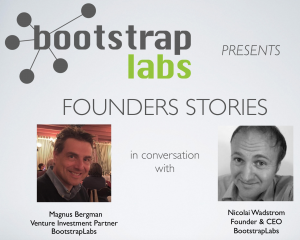 https://bootstraplabs.com/wp-content/uploads/sites/4/2014/02/prezi.png 362 363 Nicolai Wadstrom http://bootstraplabs.com/wp-content/uploads/sites/4/2018/08/Bootstrap-website_white_logo.png Nicolai Wadstrom2014-02-28 06:00:272018-07-08 03:16:25Prezi invests $100M in the White House ConnectED initiative! Our portfolio company Prezi is Zooming ideas from Budapest to the World! Since 2009, Prezi has gone from 3 founders and a few early team members in Budapest to a US company scaling to the world from San Francisco Bay area/Silicon Valley. Today there are 36,000,000 people zooming through to visualize their ideas, and they are joined by another 1.5M every month. 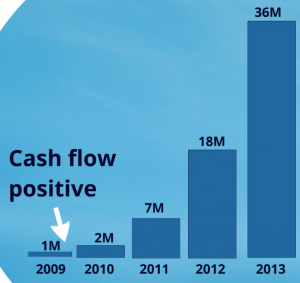 And Prezi has a strong balance sheet, being profitable and the bulk of all funds raised have not been used. 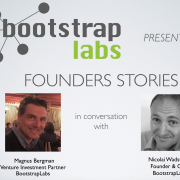 But the most amazing part is that Prezi is an inspiration to a whole new generation of Hungarian entrepreneurs, and at BootstrapLabs we are seeing more and more exciting teams and ideas come out of Hungary. Today Prezi employees ~ 4 x the amount of staff in Budapest vs San Francisco. Prezi have a great impact for Hungary, even though they “left” to become a Silicon Valley company. Pierre Ingmansson is working as a developer at PreziI used to live in Gothenburg, Sweden. I spent my days working as a software consultant, writing code and tests for customers on big projects spanning several years. The work I did was sometimes challenging and interesting, but mostly I just wrote code to fulfill the rules of a use-case in some document. I made a good living and got better and better at attending several-hour-meetings and writing extensive documentation that would never be read. However, deep down I felt something was wrong. Every year as a Christmas tradition, we finish the winter Prezi Power Week with a special charity renovation. Since 2008, we have tried to make as many people’s winters better as we can. We also aim to give them a fresher, warmer start to the new year. Of course it’s more complex than that, providing help is not that easy, especially when you try to make a long term impact on a certain community. This year we decided to go to Bag, which is a village of about 4500 inhabitants located just 43 km from Budapest. It has a settlement of about 500 Roma people that live definitively segregated from the rest of the village. When you open a new canvas in Prezi, the vast, empty space holds a lot of opportunities and perhaps a couple of failures. This is why it is important to have a reference point that guides you in developing the structure, content, and visuals for your prezi. Afterall, that’s what inspiration is all about! Well-designed prezis work not only as a whole, complete story you can enjoy, but also as real-life examples that show the details and guidelines that make the result so fantastic. In this post we have collected a top 10 list of the best prezis of 2012. These can act as a great board of inspiration for your next prezi, no matter if it is a university or a business presentation, or even a hobby project. Based on many discussions with our edu users we’ve been working to create a community site where teachers and students can talk, share and learn how to use Prezi in education, from the smallest grade school classroom to the biggest Harvard and Stanford auditoriums. 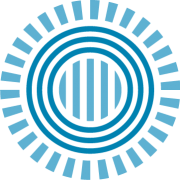 We are now pleased to introduce Prezi U, a dedicated community site for all things Prezi in education. Visit Prezi U for access to diverse content on using Prezi in education for all levels– from Kindergarten to University and beyond. Prezi U is a hub for your prezis, ideas and experiences. A channel to submit your own content and receive feedback, engagement and new skills from other Prezi U members. 1. Submit your own educational prezis to the dynamically growing edu library, which covers diverse topics and subject areas categorized by schools and curriculum. 2. Engage with others in the forums, or search for answers to your questions about Prezi in education. 3. Submit articles about your experiences using Prezi in education. Visit Prezi U today. We look forward to meeting you in our new community, and we can’t wait to see what you create!